The management rights to Little Projects’ first Gold Coast development, the $210 million luxury Signature Broadbeach apartment development set to be completed in 2020, are for sale by Tim Crooks and Alex Cook of Resort Brokers Australia. An expressions of interest (EOI) campaign conducted by Resort Brokers Australia off-the-plan management rights specialists Tim Crooks and Alex Cook is expected to create keen competition among operators eager to claim the trophy 35-storey property. The upscale apartment tower enters the market at a time of surging visitor numbers and upbeat predictions by industry leaders who say the Gold Coast is entering a new ‘golden age’ of tourism. For sale are the letting and caretaking rights to the 252-apartment Philip Avenue building plus associated real estate including reception, office and back-of-house facilities. The most recent comparable offering at The Beach Apartments nearby, also handled by Resort Brokers, was hotly contested and ultimately bought by Thai-listed Minor Hotels under its AVANI brand for what industry insiders say was likely to be a record price per key. Signature Broadbeach, due to go ahead next year for completion in late 2020, will lure visitors and permanent residents with lavish amenities on ‘The Deck’ occupying the entire podium level. Boasting a 50-metre infinity edge pool stretching along the northern edge of the building, The Deck includes private lounge and dining spaces integrated with the pool area, an outdoor barbecue and teppanyaki grill, cinema, gym, spa, sauna, steam room and lawn area. Signature Broadbeach is being developed by Melbourne-based Little Projects, headed by former Toll Holdings boss Paul Little, in a joint venture with experienced property development and project delivery company, KM Develop. Featuring a mirror-like façade reflecting sun, sea and sky, the sleek new addition to the Broadbeach skyline has been designed by Rothelowman architects in collaboration with SJB Interiors. “Its premium location in Broadbeach, which has become the tourism and lifestyle epicentre of the Gold Coast, and high-end design and finish will make it the ultimate destination,” Mr Crooks said. “A future operator will have the opportunity to work with a stylish, refined property and enter the market at a time of impressive growth in both the domestic and international visitor markets,” he said. 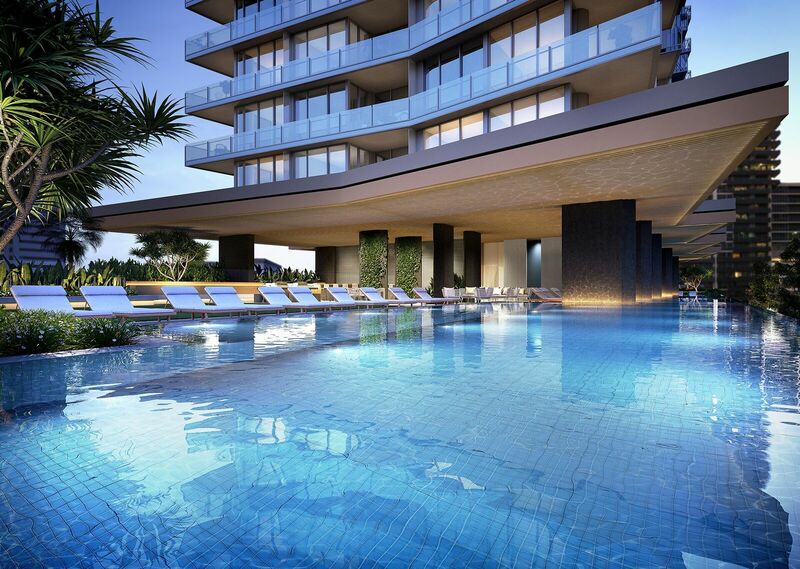 Signature Broadbeach will feature 49 one-bedroom, 192 two-bedroom and 11 three-bedroom apartments, all with ocean views and high-end finishes including Miele appliances and stone benchtops. “It is important we find the right buyer for the management rights of Signature, an operator best able to provide a level of service excellence commensurate with the premium standard of the development, to benefit all stakeholders, owners, residents and guests,” said Little Projects development director, Leighton Pyke. Little Projects has reported strong sales to date, with more than 100 of the luxury units already under contract. According to the latest Urbis Insights into the Gold Coast apartment market, it was the top-selling project for the March 2018 quarter. Mr Crooks said a two-bedroom apartment is also offered for optional purchase with the management rights, as an investment or onsite manager’s residence. To discuss the sale in further detail, phone or email Tim Crooks or Alex Cook via the below contact details. Click here to view Alex Cook's contact details and listings on The Hotel Page.